So, I decided to go all in with Steem again... just like before. I remember when I first bought my first 1,000 Steem, it was around 8cents USD and just after a month or two it hit a dollar! I also transferred some money from my remaining stock exchange account and literally have zero balance on my local bank account. Oh actually not zero but I have 59 pesos, a little over a dollar, haha! Better than a zero, right? After day trading for months, I was able to earn some bitcoins and I decided to buy more Steem. Day trading is quite stressful, specially if you're not patient enough and you have to be willing to cut losses. I still have a little bit of coin to trade but I won't be doing it as much as I would (maybe) because I don't like sitting on computer chair and just stare at my desktop while waiting for the orders to fill as takes up a lot of my time to write blogs. No, I can't multitask! Watching the market while writing a food blog? 😂 I have ADHD, so I have to do things one at a time, unless it doesn't require too much attention. I believe Steem will do good this year! I know it's still at it's low peak from last year, but I believe we had reached the dip? I can't wait for Steem to go to the moon!!! ⚡$$$ Tipped @purepinay ⚡100.00000000 SWIFT! If you don't know how I work, reply help! Currently the price of SwiftCash in the market is $0.0031 USD per SWIFT. Current value of the tip is $0.3100 USD. To find out more about SwiftCash, please read our whitepaper! Heck, I was feeling all happy with 4,000. Now I have to go transfer some funds to get over 6,000. Thanks for putting the pressue on Pure. Oh well, we Steemians gotta stick together. Don't feel bad Sharon. I am old. That means you are way ahead. Phew, I'm glad it wasn't sold (by the way do you need some employees? 😁) and I'm also glad that you powered up a huge 6000 STEEM! I've been desperate to buy some this past month but well, you know the rest. Good luck to you and us all! Really great pickup. Ive been stacking steem since 0.21 and ive added a few extra thousand in that time too. So much development on and around the Steem blockchain, future looks bright! This coco game is loco+no joke yo ! Awesome, I really like this platform and am looking to grow the user base through my community, @cryptolookout. We need more amazing content creators like yourself! Probably the best investment. You're a smart girl. She's going to leave us all behind! A good investment.,Keep it up. Definitely a good investment. :) I see a bright future for Steem. I guess this makes you a dolphin now 🐬 keep on swimming, the deep ocean blue is vast !!! How did you see the "acct zoom"? Were you checking her account specifically or watching some stats somewhere? This is funny, we believe in crypto holding and tropical agriculture holdings as our two top asset categories currently. We are very interested in sustainable agroforestry - we work in Colombia right now. Have you ever considered what you could grow under the coconuts? Which blog of yours can I read to learn more? Nice work on the 6000 power up👌I'm ready for steem to MOON as well!! There will be many uses for the tokens on each of these platforms starting in the coming weeks. We will give further updates via email. You will also need some tokens in getting 'certified'. You can read some of the perks of getting certified here. The teardrops token is also listed on steem-engine here. Where you buy some, we will apply this capital towards the second stage of development for all three projects. The easiest way of finding your tokens, sending them, trading them etc is to go on steem-engine.com and login with your steem account, either using the keychain browser extension or via steem-connect. Join the discord here as well to hangout with more than 5400 steemians. what do you think Will be the price in 10 month? Hiii my lovely friend @purepinay, nice to know about your this deal. My best wishes for you and hope that Steem go to moon as soon. You are too enthusiastic about steemit, and for 6000 steem it certainly has a high value. Congrats! I've also been buying small batches of STEEM and powering up since right before the price rise. I even told somebody "you watch, as soon as I start buying, the price will go up" lol! Good to see us moving on up though! You take a wise decision because steem is on the convergence point. Your UA account score is currently 5.281 which ranks you at #778 across all Steem accounts. Your rank has improved 6 places in the last three days (old rank 784). In our last Algorithmic Curation Round, consisting of 182 contributions, your post is ranked at #7. 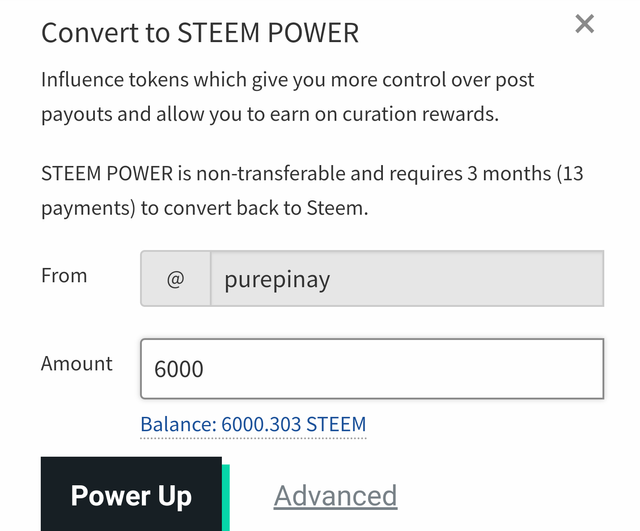 Wow that is really amazing even i want that much steem power but unfortunately can't buy due to lack of money...so i am regularly posting content so that i can earn some for free. Wow, how I wish I do have some money to spare.